Paper airplanes are fun to fly, but making a paper airplane that will sail smoothly takes more finesse than you might expect. If you'd like to add airplane making to your list of origami projects, the following tips can help you learn how to fold the perfect paper airplane! Almost any type of paper can be used to make a paper airplane, but most folders prefer to work with regular copy paper. A piece of paper that is too light makes a flimsy plane, but heavy paper can be hard to fold correctly. Look for a piece of paper that is labeled as being 20 to 24-pound thickness for the best results. When making paper airplanes, as with other types of origami, it's best to start at the beginning. The simplest designs, especially the standard dart variations, are typically the ones that fly the best. There are complicated paper airplane designs that involve many creases and some that even use two sheets of paper folded together. However, these are often designed to be more decorative than functional. 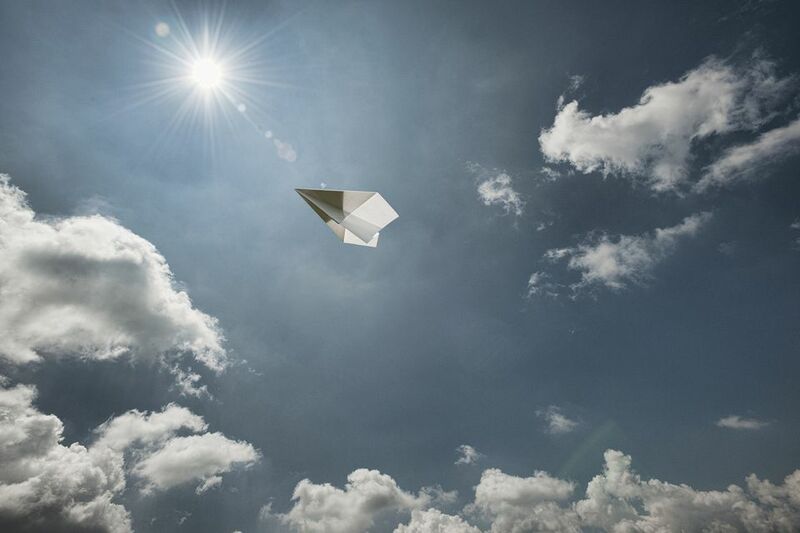 Because paper has different properties than metal, it's natural for a paper plane that flies well to bear little resemblance to a real airplane. Alex's Paper Airplanes is an excellent site for learning how to make airplanes. There are video tutorials for everything from the classic dart to a floating paper airplane. One of the most important factors in designing a paper airplane is getting the proper amount of weight at the nose of the plane. Sometimes people will add a paper clip to the nose of the airplane to weigh it down without adding extra folds. This is a minor tweak to try if you've already folded the design and want a quick fix to make your paper airplane fly better. If you've made a plane that keeps taking a nose dive, it's likely you have too much weight at the front. Bend the wings back slightly to counterbalance the heavy nose of your origami airplane. When making paper airplanes, remember that wingspan improves gliding distance. Planes with long narrow wings will fly the best. If you'd like to learn more about wingspan as it relates to paper airplane aerodynamics, PaperPlane.org explains the key concepts in greater detail. Symmetry is essential in many different types of origami projects, but it's vital to making sure your paper airplane flies appropriately. If one side is larger than the other, the plane will wobble and drop to the ground instead of gliding smoothly across the room. If you have trouble eyeballing measurements in origami, it's a good idea to keep a ruler handy when making your paper airplanes. Even a difference of a few millimeters can cause your plane to drop to the ground too quickly. Crisp creases help ensure a well-constructed plane. Creases in the wings provide greater stability and lift to your paper airplane. Use a ruler, credit card, or bone folder from your local craft store to make crisp creases as you are folding your origami plane. Traditionally, origami does not use any adhesives. However, paper airplanes tend to fall apart quickly when they are being used. To help your paper airplane keep its shape, add some tape. Staples work well in spots that need reinforcement and a bit of extra weight. Many paper airplane designs work best when they are flown gently. Launch your plane with careful precision instead of flinging it across the room! How Can You Make a Paper Airplane that Loops? Learn How to Make an Origami Crow for Halloween! How to make an origami fish chopstick wrapper! Easy DIY Origami Fan Instructions - Quick & Easy! How To Make An Origami Cupcake Birthday Card!